Saturday morning, I stumbled into the kitchen to grab a bowl of cereal. A bowl of high-fiber cereal with skim milk and some chopped apple. Something sensible. But when I opened the refrigerator to get the milk, there it was. This Chocolate Pudding Pie. A chocolate cookie crust filled with chocolate pudding and topped with whipped cream and chocolate curls. I thought about how I’d wait and have a piece after dinner. No, lunch. Maybe for lunch. No, wait. NOW. Chocolate Pudding Pie NOW. Let me tell you, sitting on the couch in your PJs with a wedge of chocolate pie for breakfast is not a bad way to start the day. If you’re going to give in to temptation, might as well do it early and make a day of it. Every component of this pie is wonderfully indulgent, starting with the chocolate cookie crust. I know, everyone waxes rhapsodic about rolled pie crusts, but there’s nothing short about cookie crusts except the time it takes to make them. Just pulverize the cookies in a food processor, mix them with melted butter and sugar, and press the mixture into a pie plate. I usually use the cheapest, plainest and probably best pie plate I have: an old-school 9-inch Pyrex pie plate . While the crust is cooling, you can give your full attention to the chocolate pudding. It’s wonderfully chocolaty and smooth without being too rich or too sweet. Once it has chilled inside the pie crust for a few hours, you can pile on the whipped cream topping and chocolate curls. It takes a few tries to get the hang of chocolate curls, but the main thing to remember is that if you pull your vegetable peeler across the chocolate and your curl breaks, the chocolate isn’t warm enough. Popping it into the microwave for a few extra seconds can make all the difference. Although eating your mistakes really isn’t the worst punishment. You can serve the pie straight out of the fridge, and it will be fine, but if you can make yourself wait (maybe take the pie out of the refrigerator, call your sister, and get back to it later), it will be much, much better. A 20-minute wait will knock the chill off your pie so that you can really taste the melt-in-your-mouth silky chocolate pudding and the hint of vanilla in the whipped cream. It will also give you just enough time to get your husband out of bed so he can have Chocolate Pudding Pie for breakfast, too. For the Filling: In a heavy saucepan over medium-high heat, warm the milk and chocolate. Whisk them occasionally until the chocolate is melted. In a large bowl, combine the egg yolks and sugar, whisking them until pale yellow. Add cornstarch, salt and vanilla. Slowly pour the warm chocolate mixture into the egg mixture, whisking them well. Return the mixture to the saucepan, and cook over medium heat until it thickens and begins to bubble slowly, about 7 minutes. Remove the saucepan from the heat, and stir the mixture until it’s smooth, about 1 minute. Pour the chocolate filling into the cookie crust, and smooth it with a spatula. Cover it with plastic wrap, pressing it directly onto the surface, and refrigerate it for 2 hours. For the Chocolate Curls: Microwave a medium-size chunk of chocolate on low for about 5 seconds. Using a vegetable peeler, slowly and evenly scrape the edge of the chunk until curls form. (If it’s too cold, the peeler will make ragged shavings instead of curls, so repeat warming the chocolate as necessary.) Refrigerate the curls until ready to use. For the Topping: Using an electric mixer fitted with a whisk (whip) attachment, beat the cream, sugar and vanilla on medium-high until stiff peaks form. Spoon the whipped cream onto the pie, and use a spatula to spread it evenly, being careful not to disturb the chocolate pudding underneath. Refrigerate the pie until ready to serve, but let it sit at room temperature for 20 minutes before serving. In a bowl, combine the cookie crumbs, butter and sugar. Pat the mixture into the bottom and up the sides of a 9-inch pie pan. Suddenly I feel inspired to end my cupcake baking spree and move on to pies. Love it! Oooo, do you think I could use peanut butter chips instead of chocolate chips? 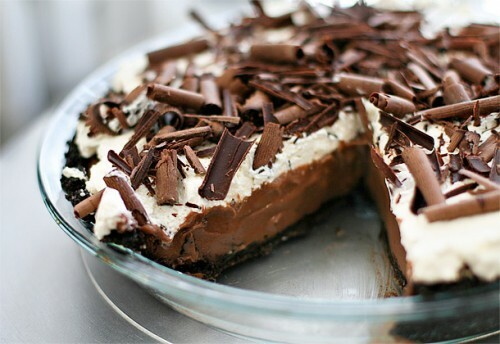 This looks like the chocolate pudding pie from my childhood that I have been dreaming about forever! Love the chocolate curls on top. And I have to confess, I too have started the day with a piece of pie before. How can you help it when it's one that looks as good as that one though?? Hey breakfast of champions! Looks scrumptious! Hi, Rebecca. Great post and recipe with all the major food groups: chocolate cookie crust, chocolate pudding, whipped cream, and chocolate curls. Thus, it is completely fitting for breakfast. Besides, who ever said chocolate cream pie is just for dessert? Mmm, yes. I'm going to make this. Tonight, possibly. I decided to use the cookie part of Oreos instead of chocolate wafers, for the crust…best idea EVER. The pie looks fabulous. No better way to start your day than eating something like this, is there? This pie was so delicious. The filling set up perfectly and was so chocolatey and silky smooth. The contrast with the crunchy cookie crust was the perfect touch and a double hit of chocolate just makes it that much better, I've kind of poo-poo'd cookie crusts in the past. Not anymore!